More than 4,000 Scientologists and guests celebrated the opening of the Church of Scientology Kaohsiung—the first Scientology Organization in Taiwan and the first Ideal Org in Asia. THE 13-STORY CHURCH OF SCIENTOLOGY KAOHSIUNG measures 108,000 square feet, making it the largest Ideal Organization in the world. MR. DAVID MISCAVIGE, CHAIRMAN OF THE BOARD RELIGIOUS TECHNOLOGY CENTER, was joined by Church officials and national and city dignitaries to officially cut the ribbon on Taiwan’s new Ideal Organization. THE RIBBON-CUTTING CELEBRATION COMMENCED with a dynamic rendition of “Sees the Whole World,” fusing contemporary with traditional Chinese instruments and dance. MR. DAVID MISCAVIGE, CHAIRMAN OF THE BOARD RELIGIOUS TECHNOLOGY CENTER AND ECCLESIASTICAL LEADER OF THE SCIENTOLOGY RELIGION with (left to right): Chairman of the International Foundation for the Peaceful Elimination of Opium Crops, Lung-Hui Chung; Representative of the Ministry of Interior, Dr. Cheng-Hsiung Huang; Founder and President of the Jinghua Society Cultural Foundation, Master Ching-Yao; Director General of Kaohsiung’s Civil Affairs Bureau, Tzu-Wen Tseng; Kaohsiung City Councilor Po-Lin Huang; and National Policy Advisor to the President of Taiwan, Liang-Chi Tan. Immediately following the ribbon-cutting ceremony, thousands of Scientologists and guests toured Taiwan’s new Ideal Organization. THE CHURCH OF SCIENTOLOGY KAOHSIUNG welcomes all visitors wishing to obtain an introduction to Dianetics and Scientology. The Public Information Center provides a complete introduction to every aspect of Dianetics and Scientology, including our beliefs and practices. The Information Center further presents exhibits on the many humanitarian initiatives and social betterment programs the Church sponsors, as well as the life and legacy of L. Ron Hubbard. Visitors are welcome to take a self-guided tour of the Public Information Center’s displays at their leisure and to return as often as they like. The Chapel further serves as an ideal venue for civic occasions, including formal banquets. On the second floor mezzanine, the bookstore makes available L. Ron Hubbard works on Dianetics and Scientology. In all, LRH’s legacy comprises tens of millions of published words in dozens of books and thousands of recorded lectures. Materials are available in 50 languages. The Garden Terrace offers an outdoor sanctuary above the crossroads of downtown Kaohsiung. The terrace is one of many gathering places provided in the spirit of an Ideal Organization: a home to both Scientologists and the greater community alike. Seminar Rooms provide for evening and weekend seminars on the fundamentals of Dianetics and Scientology, while introductory courses are offered in one of the Church’s many course rooms. L. Ron Hubbard developed the Purification Program to free individuals from the mental and spiritual damage caused by drugs and toxins, through a regimen of exercise, sauna and nutrition—all of which are provided for in the Purification Center. The mural pays homage to Kaohsiung, imbued with the wheel of life and lotus in bloom. Just beyond the Hubbard Guidance Center lounge stand rows of auditing rooms to meet the needs of Kaohsiung’s expanding field. The Kaohsiung Academy is configured to accommodate every aspect of training in the Golden Age of Tech Phase II and include all new training aids. The Academy comprises multiple course rooms, each devoted to a different aspect of training. More than 20 million words of Dianetics and Scientology technology have been translated into Chinese—9 million for the Golden Age of Tech Phase II alone. The Church of Scientology Kaohsiung includes permanent translation facilities to provide for translation of further Scientology materials as well as all dissemination items. To facilitate the growing demand for Scientology information in Taiwan and across the Chinese-speaking world, Kaohsiung’s Ideal Org houses fully equipped recording and video editing studios for the production of Chinese presentations. As is traditional in all Churches of Scientology, the Office of L. Ron Hubbard stands in honor of our Founder and symbolizes that this Church is true to his writings and ideals. It was a moment Taiwanese Scientologists had worked toward for years. And holding not just the promise but the path to spiritual freedom. 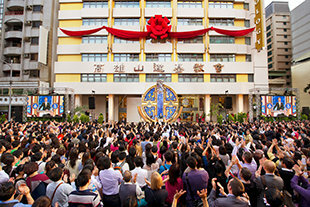 On December 7, 2013, amidst a burst of confetti and beneath a cloud of balloons, a crowd of more than 4,000 cheered as the ribbon fell on the first Church of Scientology Organization in Taiwan and the first Ideal Org in Asia. On Saturday, December 7, amidst a burst of confetti and beneath a cloud of balloons, a ribbon was cut on the new Church of Scientology Ideal Organization of Kaohsiung, Taiwan. More than 4,000 Scientologists and guests from across Asia and Oceania were joined by national and city dignitaries for the dedication ceremony. Standing at the gateway of the Chinese-speaking world, the new Kaohsiung Ideal Org is a gift to the “Beautiful Island” from members of the International Association of Scientologists in Taiwan and more than 100 nations across the world. The inauguration of Kaohsiung Ideal Org is especially significant for the fact it immediately follows the monumental release of the Golden Age of Tech Phase II. In preparation for grand opening, a team of 30 senior Taiwanese technical staff graduated their Golden Age of Tech Phase II training at Flag. This new breed of technical delivery team, coupled with Scientology materials never before available in Chinese, makes it possible to train auditors (spiritual counselors) in Taiwan for the first time. Until now, Taiwanese Scientologists had to travel to Church organizations abroad to become certified auditors. The Kaohsiung Ideal Org is poised to train all Scientologists as auditors, including those that man Taiwan’s growing network of Scientology Missions, which currently number 16 and stretch from Tainan to Taipei. The inauguration holds even deeper significance for the fact L. Ron Hubbard, as a young man, trekked across Asia pursuing fundamental questions on the origins of Man and the ultimate source of life. He explored remote cultures and arcane wisdom, during which he also gained entrance to forbidden Buddhist lamaseries in China’s Western Hills. It was these many firsthand encounters with Eastern religious traditions which spurred his subsequent research into the human mind and spirit, and ultimately led to the founding of the Scientology religion. The new Kaohsiung Church provides all visitors an introduction to Dianetics and Scientology, beginning with the Public Information Center. Video displays, featuring more than 500 films, present fundamental beliefs and practices, as well as the life and legacy of L. Ron Hubbard. The Information Center also offers a detailed overview of the many Church-sponsored humanitarian programs—including our worldwide human rights education initiative; an equally far-reaching drug education, prevention and rehabilitation program; a global network of literacy and learning centers; and the Scientology Volunteer Minister program, now comprising the world’s largest independent relief force. The Church’s Chapel provides for every type of Scientology gathering, including Sunday Services, Weddings and Naming Ceremonies—as well as community-wide events open to members of all denominations. The new Church houses multiple seminar and course rooms, in addition to dozens of auditing rooms. The Church further includes permanent translation facilities in order to provide further translated Scientology materials, along with recording and editing studios for production of presentations in Chinese.